EQ-SFM-5 is designed for making larger batch of chemical and compound (5 liters) via blending and media milling in single container. It is excellent for preparing LiCoO3, LiFePO4, Phosphorus and various other ceramic materials in a medium quantity. Equipped with a 1250W motor capable of generating a rotational speed up to 1200 RPM, it allows for the homogenization of chemicals with slow or high speeds using a multi-layer blending blade. The digital controller makes it easy for the user to program the speed, time, and rotating direction desired for each mixing session. 5-liter stainless steel container with water cooling jacket. Stainless steel blending rod with multi-layer blending blades; rotary speed adjustable from 0-1200 RPM. Programmable controller to set time, speed, rotation direction according application needs. Extra 5L stainless steel container is available as option. Power AC motor at 1250W Max. 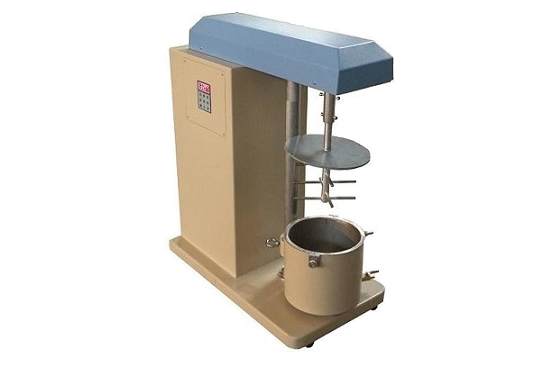 Shipping Weight & Dimensions 300 lbs; 48"x40"x47"
It is suitable for wet blending and mixing only and not suggest for use drying mixing or ball milling.